The U.S. president's message comes amid a bitter trade dispute. U.S. President Donald Trump is greeted by Prime Minister Justin Trudeau during the official welcoming ceremony at the G7 Summit in the Charlevoix town of La Malbaie, Quebec on June 8, 2018. 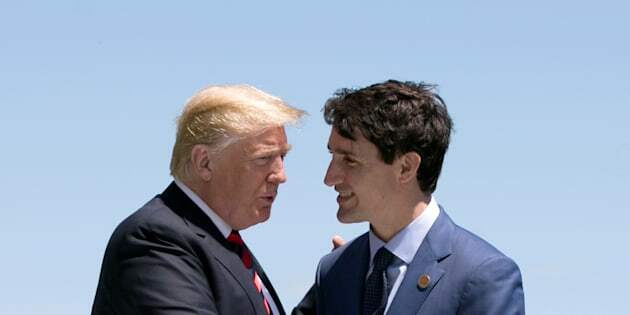 OTTAWA — U.S. President Donald Trump is thanking Canada for its "partnership on the global stage" in a Canada Day message to Governor General Julie Payette. In a written statement from the U.S. Embassy, Trump offers his "sincerest congratulations to all Canadians" as they celebrate the national July 1 holiday. He says the U.S. and Canada "stand firmly together against threats to our shared democratic values and our freedoms and way of life." The message comes as the two neighbouring countries are embroiled in a bitter and escalating trade dispute, with retaliatory tariffs on billions of dollars worth of American goods set to take effect on Canada Day. The friendly language also contradicts some of the words Trump himself has used of late to describe Prime Minister Justin Trudeau, including "dishonest" and "weak." But despite the recent tension, Trump tells Payette that the two countries should "treasure our close bonds." "Your partnership on the global stage, and your condemnation of autocratic regimes, send a strong signal in support of human rights, prosperity, and security around the world," the statement from the embassy reads.